“Get the egg.” Sitting in the tasting room of Giacomo Conterno winery, having just tasted their ’04 Barbera (driving acids, red fruit, barnyard) and’99 Monfortino (black olives, black licorice, black tea), I was appreciating Roberto Conterno’s craftsmanship, conviction, and palate when he advised this for my upcoming dinner at Antica Corona Reale da Renzo. I took the suggestion seriously, maybe a little too seriously. In the town of Cervere in the region of Piemonte is da Renzo, a well respected restaurant apparently so famous for their egg dish that not only is it patently recommended by wine-makers and hoteliers alike, but the picture on their menu’s cover is of it. Outside, except for a small sign fixed to a fire escape it is pretty unremarkable, inside it feels like a small country house converted for dining (linen and lace curtains, lace doilies, small separated rooms just about the right size for four tables, and a fireplace). All in all there is the sense that over a long time, through modest but real aspiration, rational appointments have been made here with the intent of excelling beyond the standard regional restaurant. Having just come from tasting at G. Conterno the wine choices were pretty easy. Assuming that whatever this egg dish was it would play the richer side of the spectrum, there seemed to be sense in the cleansing acidity of a Barbera. We started with ’02 and moved on to ’04, the older a little more settled and showing more of the earthy notes, the younger bright fruit and acidity. The food choices were more confusing while strangely simple at the same time. Everyone said get the egg, however they didn’t specify which. There is one antipasti egg dish, one primi piatti, and one secondi. 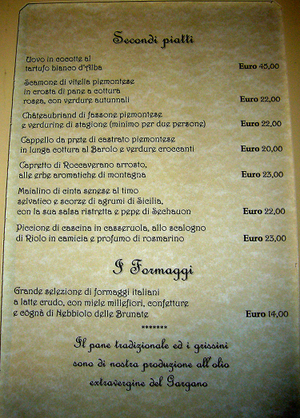 The antipasti and the secondi both involve tartufo bianco as well, confusing the “get the egg” directive all the more. The waiter explained that although they were indeed different, they were not vastly so and therefore he wouldn’t be able to decisively tell me which was meant. Not wanting to have missed the one, I decided to go with both and figured the pasta that had uovo in its description would complete the cycle perfectly. Cotechino on whipped potatoes was sent out as an amuse, setting the stage for things to come. Cotechino is rough cut pork and pig skin sausage seasoned with autumnal spices, usually boiled and served with lentils to celebrate the New Year. Here, what is often presented as hearty fortifying fare lightened by its accoutrement is served with whipped potatoes and somehow ends up a more refined dish. The bead of the filling would be called rough in relation to its size, but its texture feels as though each individual bead of pork has been tumbled in a polisher. The Cotechino slice is set on velvety whipped potatoes laden with butter and cream. To my American raised palate it tasted reminiscent of the absolute pinnacle of the flavors in corned beef hash. First up was Uovo affogato su cardo gobbo di Nizza, fonduta di Raschera d’alpeggio e tartufo bianco d’Alba: presented under a cover and already topped with the shaved truffle making the release of the dish’s aroma at the table more dramatic is a poached hen’s egg resting on thick slices of local cardoons, in a fonduta of the sharp local cheese Raschera. Cardoons are celebrated in the Langhe and should be; at their best they look like a Paleolithic species of celery and taste like artichokes would if they had a little more conviction. These were some potent, bitter samplings which made sense as they drew distinction to the creamy cheese sauce and the unctuousness of the bright orange yolk of the egg once it was broken and allowed to ooze into the concoction. For my primi, being perfectly willing to see a theme all the way through to the end, I had Ravioli al Tuorlo d’uovo, di seirass della Valle Pellice e Murazzano D.O.P. : saffron colored pasta envelopes that we call tortellini in New York, filled with a mixture of ricotta and Valle Pellice, the milky ricotta tempering the more strong, salty aged cheese. With notes of nutmeg, dressed simply in butter, the quality of the noodle and the cheese were encouraged to show off without getting too fussy. Uovo in cocotte al tartuffo bianco d’Alba: a bowl of hot cheese with cubes of bread and a fresh hen’s egg in it, topped with a pile of shaved white truffle, is once again presented lidded. As the waiter removes the lid he proceeds to begin mixing the soupy concoction, immediately explaining that if you don’t the egg will set and rather than thickening the mix and lending the richness and ability of the yolk to translate the truffles’ aroma to the palate, the dish would end up as scrambled eggs, cheese, and white truffle pieces. Their way is genius, what you end up with is a thick soup whose nature is to mark your being with the aroma of white truffle. For dessert I shared Aspice ai Frutti di bosco al Moscato d’Asti “Biancospino” dell’Az. Agr. La Spinetta su, salsa di pesche gialle ed il suo sorbetto, or at least I had a bite of the Moscato aspic with a red current in it, the gel wrapping the nuanced grapefruit and stone-fruit notes of the Moscato around the tart little berry. 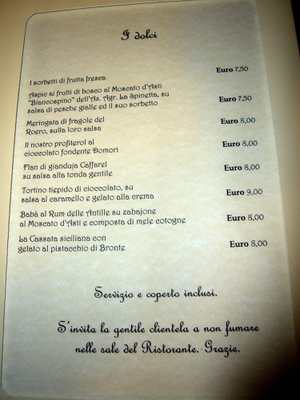 I went into da Renzo looking for a meal centered on the white truffle and had a meal centered on Piemontese tradition. Three interpretations of very similar dishes, all based on regionally typical ingredients, gave an opportunity to see roots in this food. The people of Piemonte have been handed some pretty variant cards – their chicken eggs with their bright orange yolks are legendary, the flavors they coax from the milk in butter and cheeses are incredible, and white truffles may be the single all-time greatest ingredient. 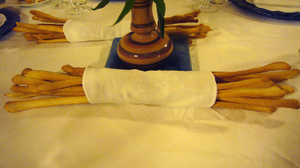 However, cardoons as they grow are inedibley bitter and fibrous, and judging from the table bread the flour available is not of the highest character. Yet all over the region the strengths of some ingredients have been accented, others’ weaknesses compensated for, and in the long run the combinations are even better than the parts. 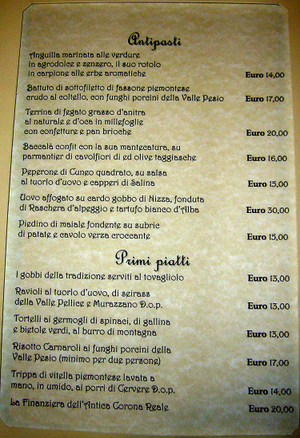 At da Renzo these traditional and kind of standard dishes are refined and raised to another level. With a component as strong as white truffle it is easy to let it outshine the others it is put in combination with. All over the Langhe there are many ways to show off white truffle; the best three are through the fats of butter (usually on pasta), cheese (usually thinned into a hot sauce called fonduta) and egg yolks (any way that keeps the yolk loose). Here opportunity has been taken where possible to elevate these interpretations to a refined level and the result is marvelous.